FYI, this is Agri-Fos and you can find it everywhere. Also, it's not totally organic like they lead you to believe but supposed to be a very effective Fungicide (and fertilizer). I started using it as a foiler spray when I noticed fungal problems on my mangos. First and foremost sorry for making my first post a question, I've been "lurking" for a bit and stealing all your wonderful opinions and ideas while planting a tropical garden . I know its bad forum/internet etiquette. I live in Cape Coral, or Lee County in SWFL. I've been purchasing and planting over the past few months in an attempt to both have tons of fresh fruit for my family, but also trying to get rid of my 'lawn' (such as FL lawns are without chemicals and regular watering... weed plantations that is). I purchased a "Glenn" variety mango in a 7 gallon from a local nursery here (Top Tropicals retail center, if that matters) and planted it in my back yard. That was around 3 months ago. Since then, it's flowered and set fruit, one is rather large and two are starting to grow. I've noticed that it is getting a concerning amount of browning at the tips of its leaves that my other Mango trees do not seem to exhibit, but otherwise seems like a healthy tree. I'm looking for advice on what it could be and any possible solutions, my initial thoughts are wind burn and/or salt burn due to having to hand water frequently due to our winter drought, and the abnormally windy days we've been having (this past weekend for instance with its 20 mph+ winds). I have attached 4 pictures, the first 2 are a Nam Doc Mai variety I bought about 1 month after the Glenn. It was a 15 gallon from a different nursery (fruitscapes on pine island in north lee county) and it seems extremely happy with no leaf burn.. some of the leaves are tattered but that was from the truck ride home tearing the leaves a bit. The NDM pictures are for comparison to the Glenn. The NDM is planted in my front yard, where the soil is much sandier. Both locations receive around the same light. The next 2 pictures are the Glenn, while it is flushing and holding onto three fruit, the leaves shown concern me. Thanks for the look at the thread! My take would be minor salt / fert burn. Overall the tree looks quite healthy though. Hopefully Har will chime in with some wisdom. From what I can see, I am leaning toward Jeff's diagnosis. While it is common in Florida to see mangoes with brown leaf tips, it also appears to minor burn due to excess fert or mineral burn. Without knowing more as to your care and conditions, the cause (soil, salt, fert, etc.) would be difficult. How close to the Gulf are you ? Do you fertilize the tree, if so, with what and how much and how often ? Have you applied any other nutritional supplements or soil amendments ? I'm not far from water, around a mile, but it is a large river brackish river that feeds into the Gulf called the Caloosahatchee. From the gulf itself I am probably at least 10 miles. However, Cape Coral is known for its massive amounts of water ways and canals that branch off from the river and I'm about 1000 or less feet from one of those. When I planted it i mixed black kow composted manure with the soil at about a 50-50 ratio. The black kow compost was rated as .5/.5/.5, but i'm not sure if fertilizer was added to the compost or not.. it's the typical bag you see in the home improvement stores. The soil was sandy but more compact than what I have out front which seems like loose packed sand, I could take a picture of it if that would help. I fertilized it with a 6-4-6 "citrus / avocado / mango" fert from one of the home improvement stores, I don't quite remember the brand name but it was similar to the Vigo brand (or was Vigo). I fertilized by sprinkling over the top at about 1/2 (or less) the recommended strength for the trunk width as the lady I bought the plant from said it was already fertilized and wouldn't have to fertilize for a month or two, which was the period of time i waited. That was about 1 month ago. From the time i bought it till now it's rained maybe twice, one of which was this past weekend, so I've been hand watering from city tap 2 to 3 times a week. The only other 'event' between planting and now is that it got a bit cold and windy for 3-4 days in February (45+ degrees, though) for 3 to 4 days, and it just did the same weather pattern again this past weekend, although it was preceded by about 3 inches of rain. Thanks pug, unfortunately this item is not available in my area. Enduser, Maybe you missed my previous post, Agri-Fos is the same thing (EPA 71962-1). You should have no problem finding it. The down side with getting Agri Fos at least for me is the added shipping cost (which I hate paying) but I know sometimes its unavoidable if that's the only way to get it. The large qt. size at HD for Plant Doctor is $17.29 and the cheapest I found online for Agri-fos is $22 with free shipping but its a Pint (16 oz. )I've never seen agri-fos anywhere around locally sold. This is a Lemon Zest which was planted 4 or 5 months ago- it was dormant all winter-there is some growth just pushing out- the leaves don't look very healthy- I have watered this-nothing else. None of the other mango tree have this. Looks like cold wind burn. Either the other trees were slightly more protected, or the LZ happens to be more sensitive. You planted your best tasting mango near the street, where the mango thieves will strip it bare! Interesting that none of the other trees have it. Maybe the cold burn is why this tree is behind the others in growth flushes? I have been guilty of over-fertilization so I was waiting . I'm planning on doing it this coming weekend. Cold wind burn is hit and miss. For example, my lancetilla got it but not the PSM right beside it. I'd leave it alone, unless Har or one of the other forum wizards thinks that it's something different. The LZ appears to be a vigorous / upright grower, so it will no doubt catch up with your other trees :-). I was planning to fertilize this weekend-should I hold off on this tree, because of the damaged leaves? If it was me, I'd go ahead and give it some fert. 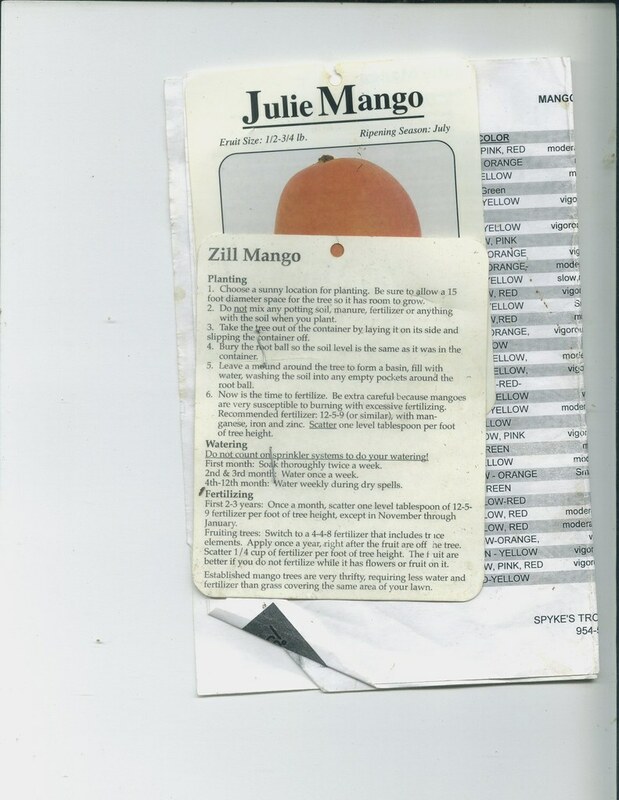 I have not burned any young mangoes or citrus while fertilizing at the Zill rates. Plus we are talking about high quality NPK fertilizer with minor elements. These type fertilizers always have a coated time release nitrogen. So harder for the nitrogen to burn anything.... it can be done but you have to make an effort. I once burned a nice ornamental vine with cheap 10-10-10 fertilizer. The nitrogen in that just goes into action, not a time release nitrogen. For kicks I feed bananas that cheap 10-10-10 or 6-6-6. Papayas would also probably benefit. No minor elements in them. Just N and P and K.
You can also spray your mangoes with Southern Ag citrus foliar found at Home Depot. This really gets the minor elements into your young trees. Even better is Keyplex foliar but I have never used it. hehe that's Patrick. He apparently has awesome soil like mrs Nat. Jealousy detected. Thats funny, the first thing I thought of when I started reading this post was (hmmmm... Time for 10lbs 8-3-9, 2:1 SoAg Foliar (1gal), 1lb Sequestrene 138fe, and a bag of Epsom salts for good measure! Just kidding of course.. I do tend to get a little out of control with the nutrition, if only I would apply it to myself and not just my plants..
As for a glow, I have noticed some of the smaller neighborhood animals with strange growths! Fact is I do have sandy soil, the only rock I have found in my yard in the first five feet is small pieces of concrete from the original construction back in the early 50's, most of the nutrition goes right through the soil to the water table. Thanks Nat! Actually, the Rare Fruit Council "Fruitilizer" that Excalibur sells is my primary fertilizer..
Lots of good advice already given. I go with minor salt burns also. freshly planted MANGOS DO NOT LIKE BLACK COW! And big ones don't need it. Mangos like sand.